Meet the new 'It' jeans | HELLO! 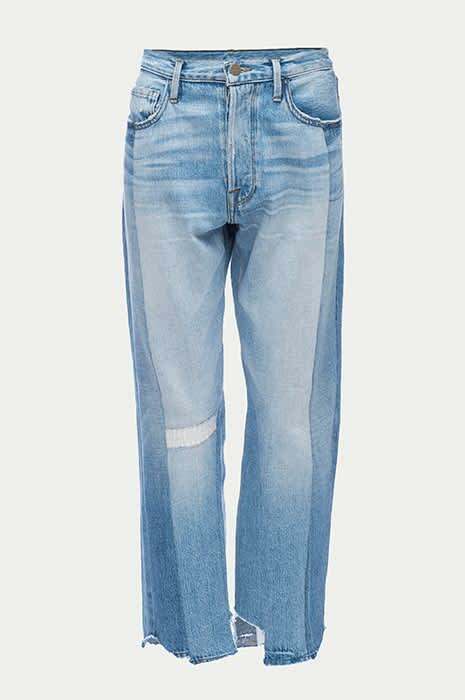 After the buzz of the £790 Vetements sold-out 'It' jeans, loved by bloggers and fashion editors alike, all we want to be seen in is mismatched jagged-hem denim. So, it seems, do our favourite supers as not one but five of fashions biggest models have all been spotted in the new jean on the block...Frame's 'Nouveau Le Mix'. Joan Smalls wearing Frame Nouveau Le Mix jeans. Made by stitching different pieces of denim together, each pair is unique. Cut to a flattering boyfriend fit with a straight-leg silhouette and staggered hem they're loved by Joan Smalls, Kendall Jenner, Lily Aldridge and both of the Hadid sisters. Lily Aldridge teams hers with an Anya Hindmarch bag and a crochet vest. With such a cult supermodel following they're proving to be the denim you need to know. Kendall Jenner accessorizes her Frame denim with white trainers and a Hermès Bag.